Best Motorcycle Waterproofs – Time To Splash Out? Wear waterproof jackets and pants all the time. Carry a waterproof suit in your luggage system. Remaining dry and comfortable needn’t involve an inconvenient chore. With some good choices and a bit of planning you can arrive at your destination without becoming victim to the weather. Often we’re faced with choices when the rain clouds begin to form. Our decisions will be based on a number of factors such as having a safe and convenient place to stop, the distance from our destination and how concerned we are about getting wet, ruining clothes or catching a cold. Changing ‘mid-flight’ is never convenient but if the process could be quick and immediately effective then would we be interested? A one-piece waterproof suit can be worn from the outset of your journey or stowed in a pannier or rear-mounted box for quick retrieval. Many models can be worn over riding boots but not all. You may require a shifting of feet and some balancing of legs while you remove and replace boots but like anything else the skill can be honed for speed. All of the reviewed suits are reasonably priced with not a great deal separating the five. Remember; these suits can only do so much. Protection and insulation is really the job of your base layers. Opt for a less thick and baggy model to keep you dry, allow freedom of movement and look good. On that score I favour the Held Splash Rain Suit. It’s not all about looks though. A streamlined slick-looking product reduces drag and, to an extent, fuel consumption. They are easier to move around in and in high winds the extra control you have will be an advantage. For the same reason I’d favour the Weise Siberian suit. Not quite as streamlined but its warmer insulating properties should give it the edge when riding in freezing conditions. With a name like that it’s not hard to see why. These two models also pack away more easily than thick, bulky items. Years ago, in a bid to stay warm in freezing water, scuba divers wore waterproof dry suits. The dated and clumsy early models did the job but looked like black rubber bags. 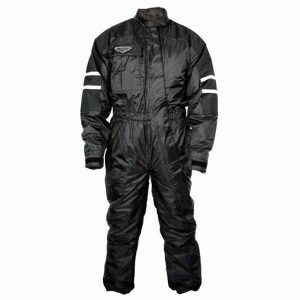 Nowadays, dry suits are streamlined, stylish and slick like Formula 1 pit crew outfits. The same differences can be seen with motorcycle waterproof suits ranging from baggy, oversized sleeping bags with arms and legs versus something more resembling the shape of… a human being! If style is important to you then wearing something that just ‘gets the job done’ may not be enough. There’s plenty of stylish, yet practical, one-piece waterproof suits to choose from. 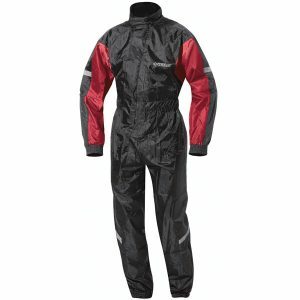 A one-piece rain suit comes into its own when you can pull over and use it quickly to keep your normal gear dry. Infrequent rain showers and riding in more sunny regions mean that your suit will stay packed in a pannier for most of the time. As water accumulates and infiltrates your clothes you’ll feel the wind chill. Your body temperature will drop and you won’t function like the alert and comfortable rider you were when starting off. This poses bike control issues when concentration falls and anxiety creeps in. Low body temperature and shivering makes us vulnerable to colds and fevers. Left unchecked hyperthermia may kick in. When riding in remote environments the elevated condition may become life-threatening. Consistently drying out rain-sodden clothes will leave you looking shabby and subdued. Perhaps you’re on your way to the office for a business meeting an under your regular riding jacket and pants is a smart suit. 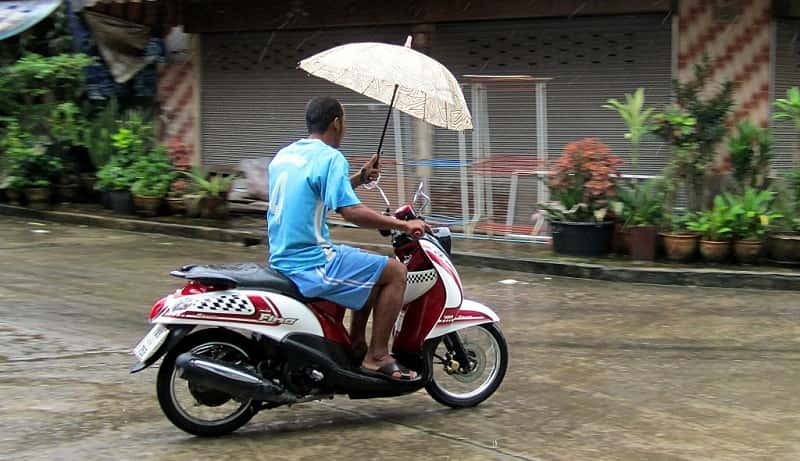 Regular motorcycle commuters will have gotten an idea of weather patterns and long established the likelihood of getting a soaking on the way to work. You might also ruin paperwork or mobile phones if your pockets and packs let in the rain. When choosing a waterproof suit, consider how it will fit over what you already wear and that it won’t hamper your movements or the safe control of your bike. It is important to remember what these suits don’t do. Padding, armour and other protective accessories are not usually part of them. That job goes to what you wear underneath. 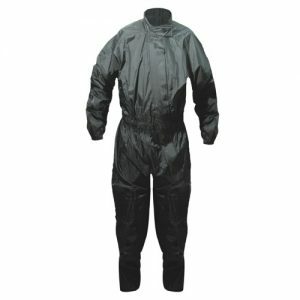 Many models are quick slip-on suits made only for waterproofing and secondary insulation. Be careful about sizing. Some models make allowance for putting them on over other gear, some do not and you have to ‘size up’ accordingly. While these suits will roll up nicely and fit into relatively small places, they are not pocket-sized. As a minimum you’ll probably need a backpack or container to stow them when not in use. Rear or side-mounted panniers are ideal but a decent backpack will do the job nicely. Taking streamlining to yet another level is the Held Splash Rain Suit. They achieve streamlining with a nylon outer shell and mesh-lined upper body. Excess material is further restrained by an elasticated waist and zip and Velcro fasteners around the wrists and ankles. Entry is via a diagonal front zip. The high collar further keeps out the driving rain giving an all-round tight and compact fit. For a more stylish model try the Weise Siberian suit in black. Also going to 5XL it’s made of a tough Taffeta nylon fabric and fully waterproof throughout. Extra insulation is provided with a polyester quilted lining. The model looks less ‘baggy’ than others. Zips and Velcro strap closures help keep everything more compact. At slightly more than the previous models it is likely to keep you dry and warm in very cold and wet conditions. 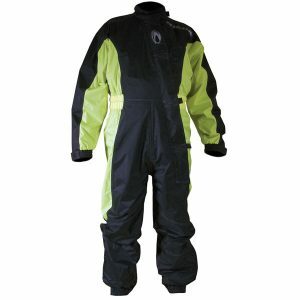 This waterproof suit has hi-visibility yellow strips around the arms, legs and shoulder sections of the otherwise black areas. This may require a little more cleaning as it picks up the dirt but being seen in the view obscured rain is an advantage. The company advises customers to choose two sizes bigger than normal to ensure the suit fits over regular riding gear. That’s an indication that they’re not sized for ‘over wearing’ already. 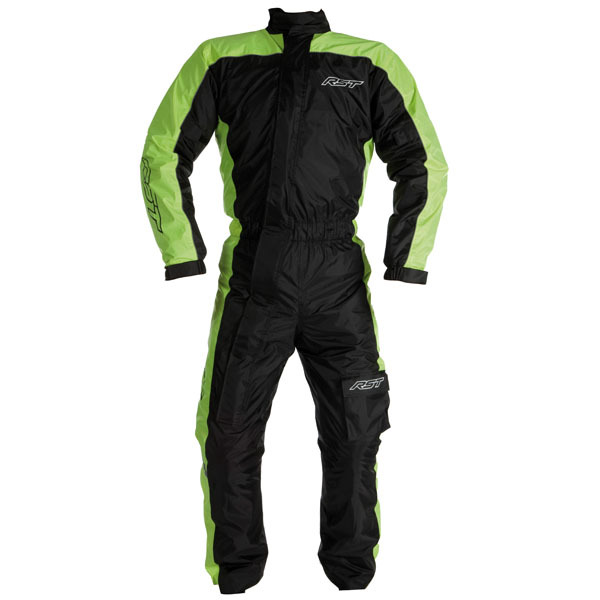 The easy-to-don suit comes with 3M Scotchlite reflective panels on the arms, back and legs for added safety at night. Like many waterproof suits it has no protective armour or padded areas. The Richa Typhoon one-piece suit is similar in appearance to the RST however the yellow areas are largely under the arms and down the thighs. The design is lightweight making for a comfortable ride. Unlike some other models the Richa suit is already oversized to reflect your normal size of clothing. In other words if you’re an XL jacket then buy an XL Richa suit. Don’t worry, the size range goes right up to 5XL! The suit folds into an integral bag which can then be worn around the waist while riding. This is ideal if you don’t have a tank bag, backpack or panniers. The Weise Tempest Over Suit is unlined making it more light and baggy looking than other models. This will appeal to riders looking for a quick waterproof-only solution leaving their existing clothes to insulate them. The overall material is relatively compact with taped and welded seams and elasticated waist, ankle and wrists. Leg gusset and poppers allows the suit to be put on without removing motorcycle boots.